A smaller version of the popular Raspberry Pi 3 will go on sale in a few months. Raspberry Pi is developing a new version of its Compute Module, a single-board computer that plugs into specific on-board memory slots. The new Pi will be more like a mini-computer inside a computer, and it won't come with a power supply. The Compute Module will have similar circuitry to that of Raspberry Pi 3, a wildly successful computer that can be a PC replacement. But it will be smaller, with the memory, CPU, and storage embedded tightly on a board. The differences between the Compute Module and the Raspberry Pi 3 will be subtle. While the Compute Module will have a 64-bit ARM processor like the Pi 3, it won't have Wi-Fi, Eben Upton, founder of Raspberry Pi, said in an interview with IDG News Service. The Compute Module could ship as soon as this quarter, Upton said. It will be priced similar to its predecessor, the 2-year-old Compute Module, available from reseller RS Components for about US$24. The older Compute Module is based on the original Raspberry Pi. Like Raspberry Pi 3, the new Compute Module will work with Linux and Microsoft's Windows 10 IoT Core, Upton said. A Compute Module Development Kit, in which the Compute Module can be slotted for testing, may also be sold. 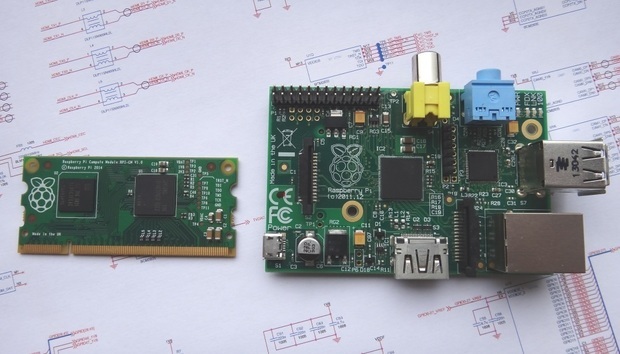 The Development Kit could have multiple connectivity and port options, much like the Raspberry Pi 3. The Raspberry Pi 3 has sold millions of units and has evolved from a gadget development tool into a PC. The Compute Module could also appeal to businesses that want to put computers inside electronics or industrial equipment. Small computers are being used to operate factory equipment, and the Compute Module could fit in that scenario. Raspberry Pi is already successful among computing enthusiasts and tinkerers, but Upton wants to break into that industrial market. People are buying inexpensive Pi boards and increasingly putting them in equipment, either for testing or for real-world use, Upton said. The Compute Module falls into a category of devices called single-board computers, or SBCs. Like its predecessor, it's likely the new Compute Module will be compatible with SODIMM slots, which are cheaper than PCI or SDRAM slots and can carry high-speed signals reliably. Companies like Atmel and Freescale also sell SBCs with microcontrollers that are used to test applications and hardware. The 64-bit ARM CPU in the Compute Module will be faster than microcontrollers on the other boards. Wi-Fi is a signature feature of Raspberry Pi 3, adding much-needed on-board connectivity features. The economics and small size of the Compute Module make it difficult to embed Wi-Fi circuitry.